33-2, Jalan Radin Anum, Seri Petaling, 57000 Kuala Lumpur, Malaysia. Fluid Prowess has been a leading provider of pump solutions for the Industrial , Food & Beverage , Pharmaceutical , Chemical and Petrochemical markets since 2006 . Many Factors have contributed to our success , but the most important is our ability to provide unmatched overall value and true pumps and fluid handling solutions for our customers . We have redefined the traditional expectations in the industry by setting new standards for low cost of ownership , long service life , and ease of maintenance. 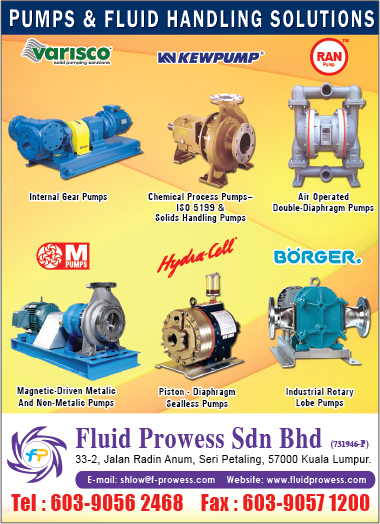 Offering a comprehensive range of cost effective positive displacement and centrifugal pumps. Our range of pumps are available in a variety of designs and materials. With over 8 unique product lines to choose from ; no matter if your service requires a simple cast iron centrifugal pump with single mechanical seal to a non-metallic sealless external gear pump, chances are that Fluid Prowess has an optimal pump for your application . Providing the experience and total capabilities that few other suppliers can match . We have in-house expertise to carefully review your requirements and assist with the selection of the best products to meet the needs of your application . If needs require it , we can package the pump and provide anything from simple engine or electric motor driven pump skids to complete enclosed pumping stations . Offering excellent support for the equipment we provide . Fluid Prowess supports our products through a team of service technicians and carefully selected and trained dealers . Our dealers are located in Penang , Johor Bahru , Kerteh , Melaka , Kota Kinabalu and Kuching .